News Regarding Antique Badge which featured previously In Newsletter. We received some intrigued enquiries about the badge which we featured last month. It’s a rare souvenir from when Allied Forces were based at Fontainebleau (HQ AFCENT) in the 50s and 60s. 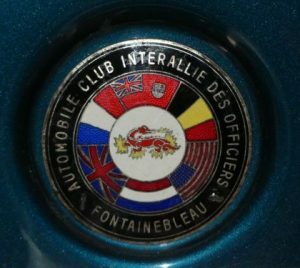 The Automobile Club Interallie Des Officiers was one of many extramural activities for the substantial (2500+) multinational headquarters staff. History does not relate whether membership was strictly for officers; one suspects that if the automobile was sufficiently interesting the rules were flexible. The enamel badge was made by Chobillon – a manufacturer of badges and medals in Paris – and rather than languish in a display cabinet it now adorns a rather splendid road going 5 litre sports racer. ← Antique Toys Selling Well At Auction.